*A One Time Investment plan with 10 times of risk cover. *Accident & Disability benefit also available. *Tax Rebate while investing and tax free returns on maturity. *Combination of Investment and High Risk Cover. *One time Premium Plan for 12 Years Term. *Guaranteed Returns on Maturity with Loyalty Addition. *Risk Cover available 10 Times of Amount Invested Plus Loyalty Additions. *Option for Additional Accidental and Disability Rider, 1st time in Single Premium Policy. *Liquidity by way of Loan or Surrender. *High Yield Investment in current declining interest Scenario. *Settlement Options of Policy Proceeds (for 5,10 and 15 Yrs), 1st time in the New Product Regime. b. Substitute for other Instruments Bank FD, Post Office, M.F etc. 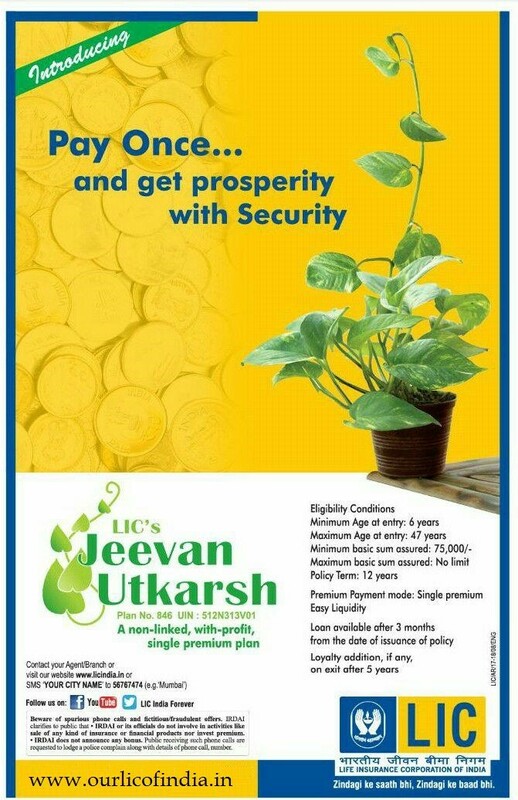 This entry was posted in Insurance and tagged Best Single Premium Plan, Jeevan Utkarsh. Bookmark the permalink.